The swimming course will start by the Flowing Lake, this is an open water place which suitable to swim. The audience can also watch the game comfortable beside the swimming course. 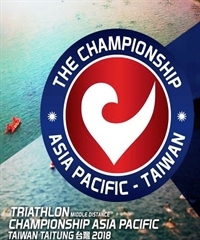 In the bike course, athlete will through the lofty Carp Mountain and the spectacular Pacific coastline, the last running course, combined with the lively Taitung city center, quiet and pleasant fields, and then the finish line is in the Tie Hua village.